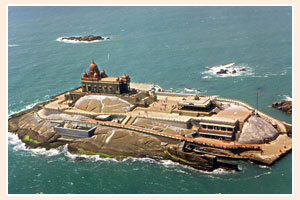 Vivekananda Rock is a sacred monument and popular tourist attraction in Kanyakumari, India. It is located in the midst of the ocean, just 400 meters from Kanyakumari. It was built in the year 1970, under the guidance of Shri Eknath Ranade. The Vivekananda rock temple is dedicated to one of the greatest spiritual philosophers of India, Swami Vivekananda. Vivekananda Rock was built with a blend of traditional as well as contemporary architectural styles of India. A life size statue of Swami Vivekananda has been set up inside the memorial. The Vivekananda Rock memorial consists of two main structures, the Vivekananda Mandapam and the Shripada Mandapam. The Vivekananda Mandapam has a meditation hall known as Dhyana Mandapam and the Shripada Mandapam has the sanctum sanctorum.